A meteorologist with Environment Canada says a mysterious object which appeared to be hovering over an iceberg in Bonavista Bay isn't much of a mystery afterall. 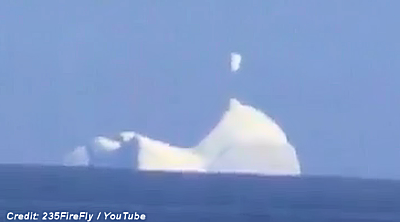 YouTube user 235FireFly uploaded a video of icebergs spotted off Salvage this week. "I noticed what appeared to be a chunk of ice just barely attached to an iceberg. Hoping to catch it collapse, I took out the camera and zoomed in," the user commented below the YouTube post. "What you can see is a white object not attached to the iceberg, but rather spinning around and changing shape. There was no fog and it was a perfectly clear day so I'm up for debate. So any ideas what this could be? I'm open to all opinions, UFO, illusion or what? This is easily the strangest thing I have ever witnessed in my life." Is it part of the iceberg? Is it fog playing tricks with your eyes? None of the above, said Environment Canada's Rodney Barney. "Mirage effect due to marine layer temperature inversion," Barney said via Twitter, shortly after the video was posted by CBC News. . . .
and the white object that appears from nowhere at 46 seconds...to the right of the iceberg...what was that?